Matt Ferguson says the Franklin's Gardens atmosphere is the best he has experienced. 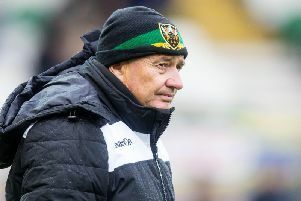 And the Saints assistant coach can't wait for more of the same when Leicester Tigers come to town in the Premiership Rugby Cup on Saturday afternoon. Ferguson arrived at the Gardens last summer, following roles with England's women's team and London Irish. And he is loving working in Northampton, where he feels the noise created by the home fans is like nowhere else. "It's an unbelievable club - a great place," Ferguson said. "Everyone kept telling me before we went to Clermont what a special place it is because I'd never been there before, but I actually didn't think it compared to the Exeter game here (on December 28). "I've been lucky enough to coach in World Cup finals but I thought the atmosphere here at the Gardens was better than anything else. "It's testament to the fans and it means so much to the boys - that's why we're desperate to put our processes together and put in the performances. "Hopefully the processes we continued to put in place last Friday won't be a one off and hopefully everyone can see the way we're trying to play under Chris. "We're trying to upskill our players and get more of the sort of performances you've seen in the past two weeks." Saints scored 17 tries as they cruised to a 111-3 victory against Timisoara Saracens in the Challenge Cup last Friday. That set up a return to Clermont Auvergne in the quarter-finals at the end of March. But the immediate focus is on Saturday's game against Tigers, with a semi-final place up for grabs for Chris Boyd's men. And Ferguson and his fellow coaches have been ensuring the players remain grounded after last Friday's huge win. "It's not a message just to the young guys - it's something we talk about quite a lot," he said. "Dicko's (defence coach Alan Dickens) review of Clermont was pretty clear in terms of what he felt. "It's not particularly a youth thing and all the boys who played last Friday had something to prove to themselves and to the club. "Our changing room is a workmanlike changing room, there's not a lot of celebration, which is great. "It's about getting the job done and now we can move on to this week, which is going to be an equally tough challenge here."